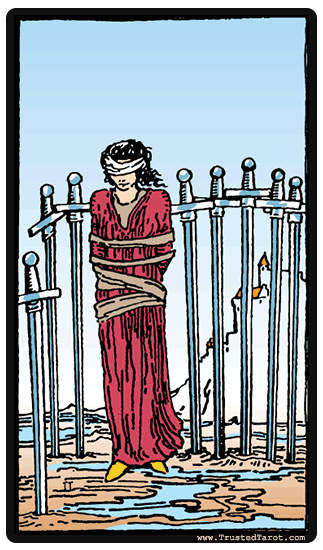 And now, the Eight of Swords is here to remind us that we feel like we are stuck, trapped, no good options available. Like I mentioned in June’s blog, when dealing with this energy, the first thing we need to do is to stop and rethink everything. Don’t make any hasty decisions. Know that just because you feel trapped doesn’t mean the right path or answer doesn’t exist. You’ll just need to work a little harder to find it. Take the month of November to think about your plans and double-check your recent decisions to see if they might need some tweaking. I know it never feels good to feel stuck, but if you can look at this month as being one of review vs one of entrapment, then future months might hold healthier results. What was happening back in June? What decisions did you make back then that you might need to rethink? What might you still be dealing with from last June that is now demanding your full attention or a resolution? Again, take a deep breath and face November standing upright and unafraid. As I said in my June post, show the month who’s boss! You! So, as a boss, I say: Here’s to this month giving us the United States’ first Madame President, and here’s to all Republicans running for office getting their stank asses kicked on November 8th, and here’s to this month being the beginning of the demise for so many awful people, from Donald Trump to Mike Pence to James Comey, and so many more. Here’s to all of us surviving the month and for those of us in America, when we celebrate Thanksgiving, remember who still needs our help and reach out. They are more trapped than any of us will probably ever be!